This dress has been in the works for a very long time. 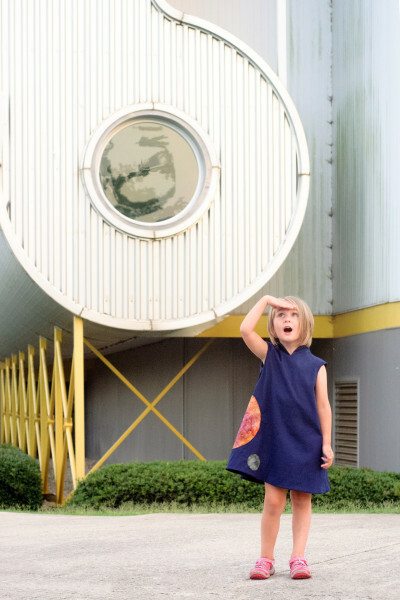 Living near the U.S. Space and Rocket Center for a summer prompted a fascination with astronauts and space for the kids and some super fun dinners of Schnitzel underneath a massive (that’s an understatement) Saturn V rocket during the center’s Biergarten each Thursday evening. Being around space stuff and having an entire family pumped about all things having to do with space and living in space and stuff in space, led to some pretty awesome sketches of dresses. One of which turned into this Kosmos Dress. Abstracted into the simplest shapes, this swing dress features an integrated standing collar and cap sleeves add some POP while keeping with the streamlined design. 2 planets (or a planet and a moon) are uniquely added to the dress and wrap around to the back. 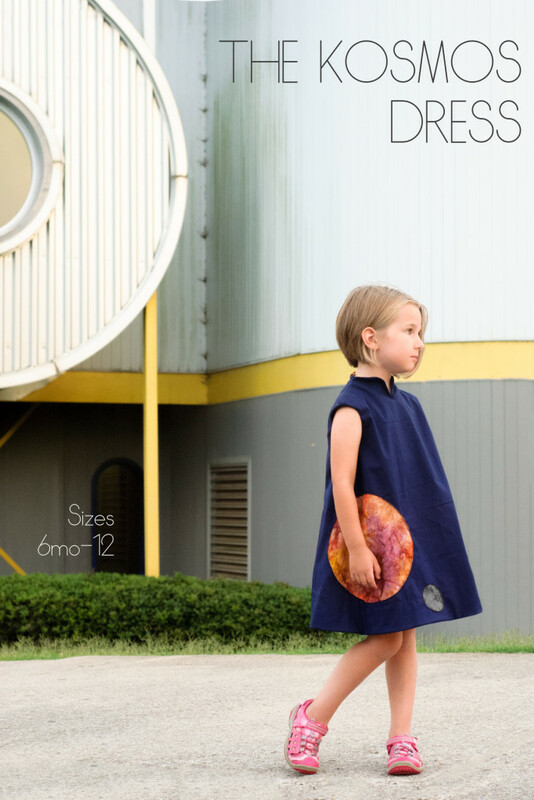 This dress is in keeping with the space theme of our original idea with 2 planet-esque buttons in the back for additional interest. Partially lined, the dress features little topstitching which is in keeping with the minimalistic design. No zippers or button holes, this dress is an advanced beginner. The call is now closed. Thank you for applying! Testers will be contacted by email this afternoon. Back To School Means PICTURE DAY!! !